Image posted with permission from SummerTomato. If you are new to clean eating, grocery shopping can seem like a really intimidating undertaking. I remember the first time I tried to shop clean. It wasn’t pretty. In fact, I believe I made several follow up trips that same day to return many of the items I purchased on my first round of my label reading frenzy. They were not happy with me at the return counter. If grocery shopping is your downfall, here are 5 guidelines I used in the beginning that really helped. Shop the perimeter! If you stick to the walls instead of the aisles of a store, you are far more likely to find clean foods. The majority of stores are arranged this way. Along those walls you will usually find fresh produce, dairy, lean meats, fish and dairy. (And don’t forget some pretty flowers to brighten your table, or your sweethearts day!) Avoid the deli and bakery and you’ll do just fine. Know your aisles! Chances are, you probably shop at the same store (s) weekly. So figure out which aisles have your necessities, and avoid the rest like the plague. Look for aisles that have frozen veggies, meats and fish, oatmeal and tea. Aside from cleaning and personal care supplies, those should be the only aisles you ever venture into until you really get a handle on how clean shopping is managed. Fill your tummy! You’ve read it before, and now you’ll read it here again… Never shop on an empty stomach! As a clean eater, you should never go hungry anyway. But it’s never more important than when you are grocery shopping! You should always shop by your list, not by your craving of the moment. So be sure you’re keeping hunger at bay BEFORE you shop! Know your ingredients! If you do venture down those other aisles, be sure you know how to read a label. Keep in mind that the nutrient percentages given can mean something very different from the actual list of ingredients. For example, just because there is a percentage of sugar listed, does not mean there is added sugar in the ingredient list. Always look at the ingredient list first. If that’s clean, then go to the nutrient percentages. Shop in bulk! Not only will you save money, but you are far more likely to end up with whole, clean ingredients to cook with. The bulk section, while not always completely clean, is a great area for finding clean ingredients you may not have tried before. Remember that variety is very important in any healthy diet. I’m sure, as you learn to shop clean, you’ll come up with your own tips and tricks. But to get you started, this list should at least get you going in the right direction. And remember… when all else fails, leave the grocery store and find your nearest farmers market! LOL! That flow-chart is a riot! Thanks for sharing, it made me laugh! Kimber – Glad you enjoyed it! I would add: Always buy organic, grow your own, or know your farmer and how he/she farms. It’s the only way to be sure you are not getting geneticly engineered “food”. Or meat from animals fed GMO grains. If it is not labeled 100%USDA organic it probably has pesticide residue and may have GMO ingredients. The modified genes are carried in the pollen and contaminate other fields. This can produce super weeds (not suseptable to Round-up or similar herbicides) and ruin certification for organic farmers for several years. (They have to be free of pesticides and synthetic fertilizers for 3 years) Organic farmers and others who choose not to use the GMO seeds have actually been sued by the chemical company for patent violation for saving their own seed that was contaminated by pollen from herbicide-ready corn or soybeans. Jodi – Agreed! But many people can’t afford to eat 100% organic. (Me included, though I would love to) I think the important thing for most people is to buy those organic foods that are most likely to be GMO’s like corn and soy, and buy organic produce for “The Dirty Dozen”. If you can do more than that, wonderful! Love the flowchart! I couldn’t have put it better myself. The only thing I would add to your middle-aisle quest would be dried beans. One of my new favorite blogs – thankyou! Karena – Fabulous! Welcome! And yes, dried beans are a must in my house too. Brittany – Glad you find it useful! It’s definitely a challenge in the beginning! I’m new to your blog, but am really loving it! Unfortunately, because I live in remote outback Australia there are a lot of foods unavailable to me that most people take for granted. Doing the best I can though!! Samantha – If you stick to traditional and local foods, you should be fine. It’s the processed, commercial stuff that will get you! 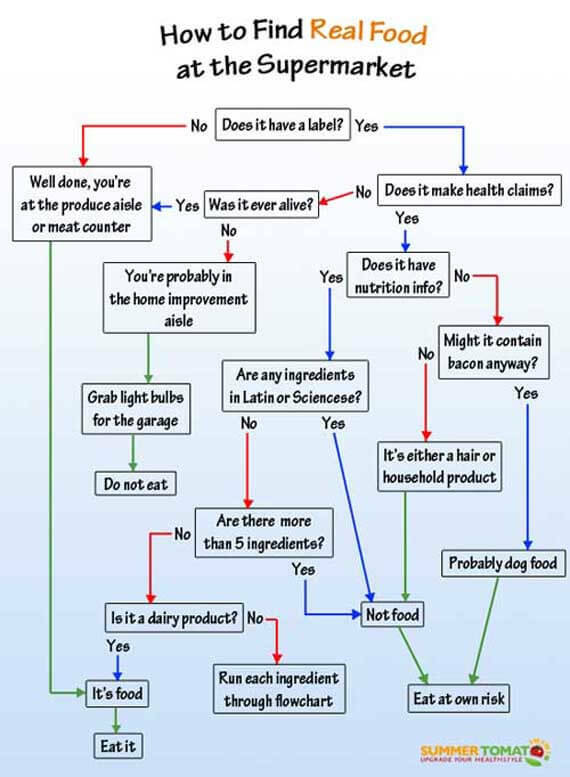 The flow chart is hilarious! Made me laugh (again!) Wanting organic food that didn’t cost 2 arms and a leg, and usually looked older than I was, is the reason I started gardening in the first place in the mid-1970s! Yes the dirty dozen and clean 15 lists are a great help. Actually the environmental working group has a list of the 49 fruits and vegetables that were tested. I printed it up and taped it to a cabinet so I can look at it when I make my shopping lists. Availability and cost have improved tremendously since then . Organic produce used to cost several *times* conventionally grown and was only available in a very few health food stores. (which mostly sold vitamins and other supplements) Still it is frustrating when the dirty dozen are not available organic. Jodi – Yes, it is. I just go by the very lose rule that if it has a thick skin, I can buy non-organic. If it has a thin skin, then it should be organic. Doesn’t work for everything, but it helps me through the off seasons. Jo – Thanks so much! I’m studying to become a registered dietitian. Healthy food has become my life and I love it! Glad you’re enjoying my site! Jo – That’s pretty close. Dietitians have medical training in nutrition and have to pass a state board test to become registered. Nutritionists do not. There are many good nutritionists out there, but do be careful because it’s very easy to get a “certificate” for $50 over the internet with little to no training. That being said, there are a lot of nutritionists out there who are very good at what they do and have taken extensive training. Which one you go to can depend on many different things. If you have real medical concerns, a dietitian is your best bet. Great shopping tips! I loved the chart! Would love to shop all organic, but on a fixed income it’s impossible. So I buy what I can organic in the ‘thin skinned’ group… berries, apples, celery, spinach and so forth. That’s a great way to do it! I do the same. Are canned beans and tomatoes (diced or stewed) clean? Sorry of that’s a silly question. Elizabeth – Depends on the ingredient list. Hi I would love to share this article with my readers on Women’s Fitness Facebook page. Would you be happy for me to share it?